LUBBOCK, Texas – Senior Armani Wallace spent years preparing for moments like Friday on the runway Texas Tech’s Sports Performance Center. Facing arguably the finest gathering of collegiate triple jumpers this side of the NCAA Championships, Wallace delivered – over, and over, and over, and over again. Producing the four best jumps of his career on his first four attempts, Wallace bounded off with a new Florida State record and a victory over a field which included 2018 NCAA champion Tahar Triki. After taking down Rafeeq Curry’s 2006 record (16.00 meters) on his second attempt, the Orlando native followed with a breath-taking burst of 16.72 meters (54-10.25) on his third attempt. He also broke the 23-year-old facility record and now ranks No. 2 in the NCAA and No. 4 in the World. Wallace’s series of 16.40, 16.01, 16.72 and 16.46 could have only been better had he not fouled – narrowly – a fifth attempt that was pushing 17 meters. The two-time, second-team All-American spent a lot of time envisioning a day like Friday. Sophomore teammate Jacore Irving did his best to follow suit, posting his finest series as a Seminole topping out with a personal-best of 15.02 meters (49-3.50) to finish eighth. While Wallace stole the spotlight, there were some enlightening moments from the men’s sprint squad, which advanced five to the eight-man finals of what may well have been the fastest January 60-meter dash field finish on record. 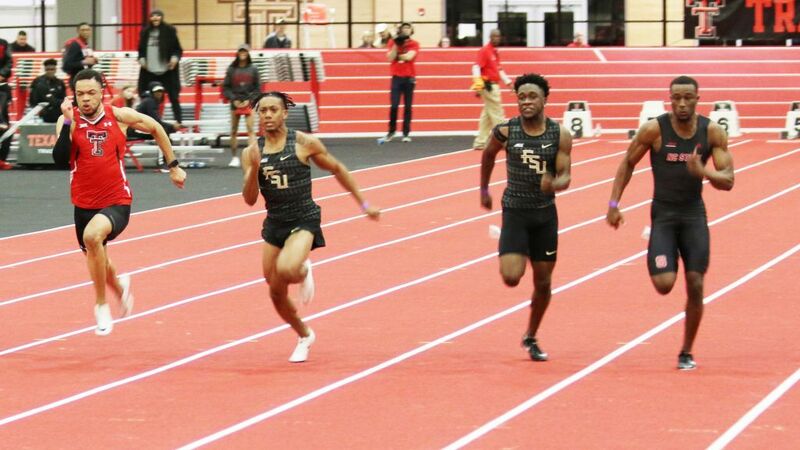 Junior transfer Kasaun James and freshman Bryand Rincher were up to delivering encores from their season-opener at Clemson two weeks ago, racing to the finish in personal-bests of 6.56 and 6.59, but finishing second and fourth, respectively. For the second time in two meets they were edged in the final by NC State’s Cravont Charleston, who edged James at the finish by one-thousandth of a second. Texas Tech’s Andrew Hudson was third, also in 6.56, as the lead trio now share the world lead, separated by just two-thousandths of a second. Darryl Haraway (6.65), Andre Ewers (6.66) and Michael Timpson Jr. (6.71) authored season-bests to lock down finishing spots 6-8. James was encouraged by his progress, if not the outcome. Yet there’s no time for satisfaction and more to be accomplished, beginning Saturday when most of the same men will return to compete in the 200-meter dash and be joined by Rougui Sow in the women’s long jump. A large contingent of Seminoles opened up Friday at the two-day Bob Pollock Invitational in Clemson, S.C., churning out some solid performances, led by the women’s distance team. The quartet of Megan Mooney, Madison Harris, Jodie Judd and Maudie Skyring delivered the lone victory, winning the distance medley relay in 11:30.15. That was after Judd and Militsa Mircheva posted personal-bests of 4:42.10 and 4:44.24 to place second and fourth in the mile; a race which saw all six Noles entered register season-bests. Michael Hall was a late add to the men’s mile and turned in a third-place finish in 4:05.32, then came back to anchor the Noles’ runner-up distance medley relay in 9:59.02, which should qualify them for the fast heat at the ACC Championships. Redshirt junior Hunter Napier posted the best first-day heptathlon score of his career (2,474 points) and is in 10th place entering Saturday’s final three events. Napier began Friday’s competition with personal-bests in the 60-meter dash (7.44) and the long jump (6.31m/20-8.50). The Noles will return to action Saturday with the 3000-meter run and the weight throw events of special interest. You can follow the action via Twitter @FSU_Track and check back Saturday night for a complete recap at Seminoles.com.